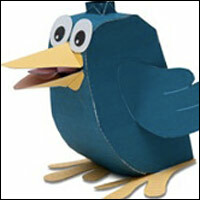 Twitter Box! 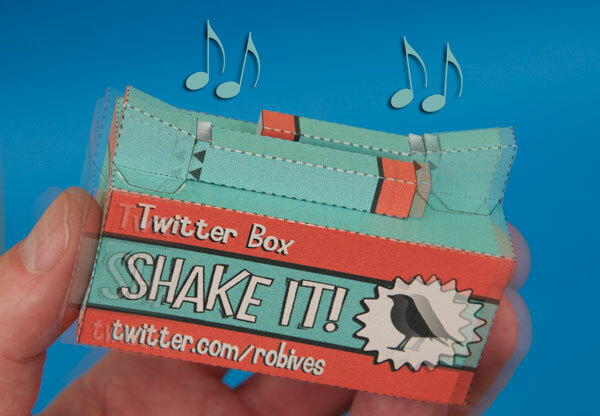 Shake the box back and forth and the internal weighted piston powers the two pipes on top of the box making a twittering sound! 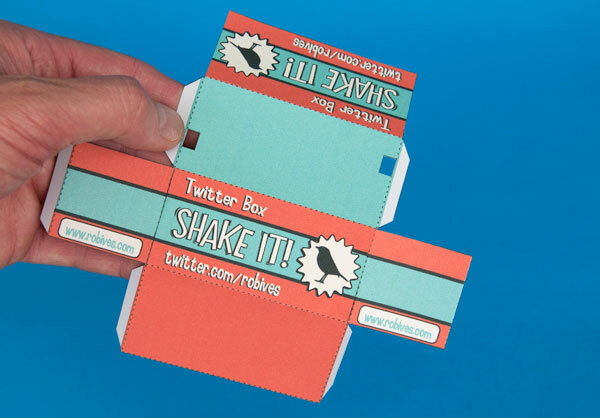 Download and make this project for free in either colour or in mono for your own twitter address. Feel free to convert it for your own use as long as you leave the url www.robives.com/blog/twit visible in the file. 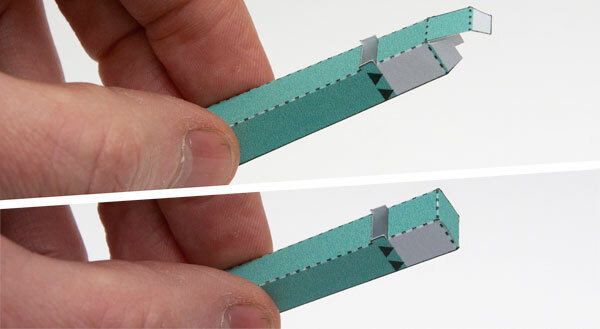 Print out the parts onto thin card (230 micron/230 gsm) Score along the dotted lines and cut out the holes. You will need a couple of coins as weight for the piston. UK two pence pieces are perfect. They are 25mm in diameter and weight roughly seven grams each. 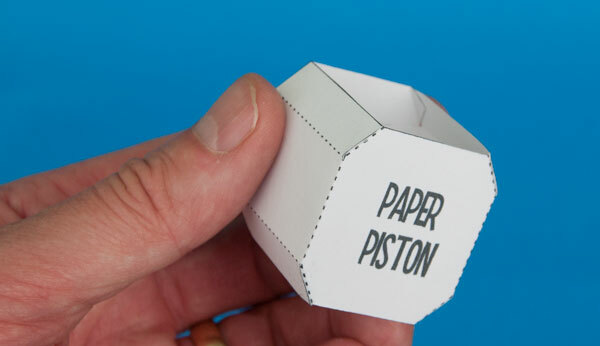 Begin by constructing the piston. Glue the two parts of the piston inner back to back with the flaps at ninety degrees to each other as shown above. Glue three sides of the piston as close to the centre line of the piston as you can. Fold the remaining flap of the piston body over and glue it down. Glue the four tabs down to make a chamfered edge. These chamfered edges are there so that the piston doesn't bind on the internal tabs in the box. 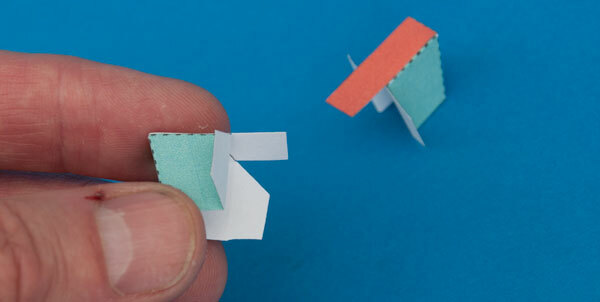 Fold two coins into the coin holder and glue it down. 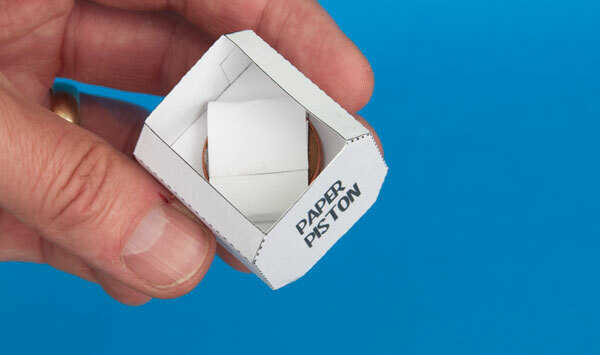 Glue the coin holder into the inside of the piston. Set the piston to one side so that the glue can dry completely. Glue the two box ends into place. Make sure that they are the right way up. Close the box leaving one end open. 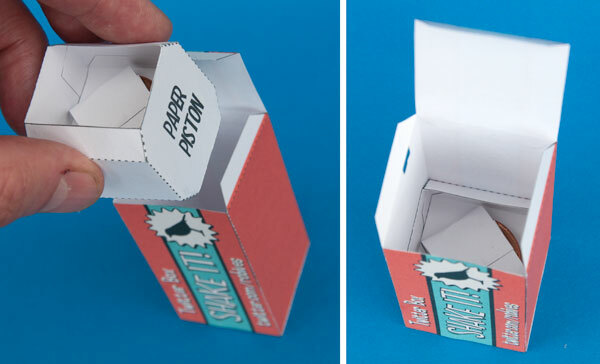 Drop the piston into place inside the box, it should be able to move freely up and down inside the box. Glue the end shut. Keep checking that the piston is still free to move as the glue dries by shaking the box back and forth. Assemble the two pipe ends as shown. Be as accurate as possible in the construction of the pipe parts. 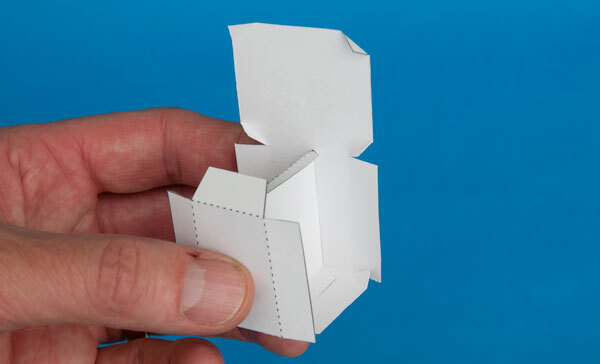 Carefully line up the edges and make sure that there are no holes where air can escape. Fold round and glue together the pipe body. The left hand end of the pipe in the picture above is open. 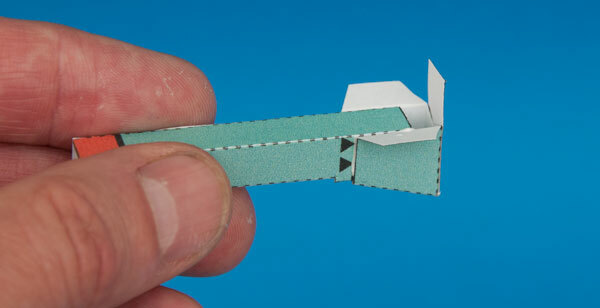 On the right hand end of the pipe, fold the flap down and glue it into place. Glue the pipe end into place. Use the grey areas and the black arrows for alignment. While the glue is still movable, blow through the whistle to check that it works making adjustments if necessary. Complete the model by gluing the pipes into place so that the holes in the back of the pipes line up with the holes in the box top. 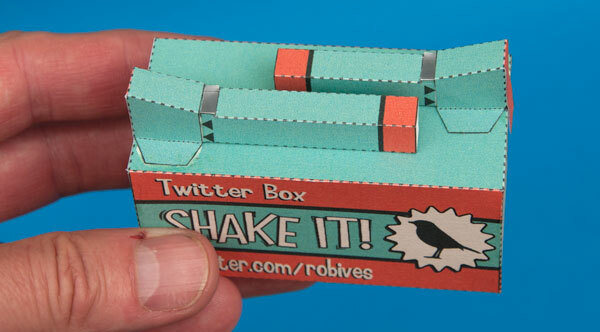 Once the glue is dry shake the box back and forth and hear it twitter! 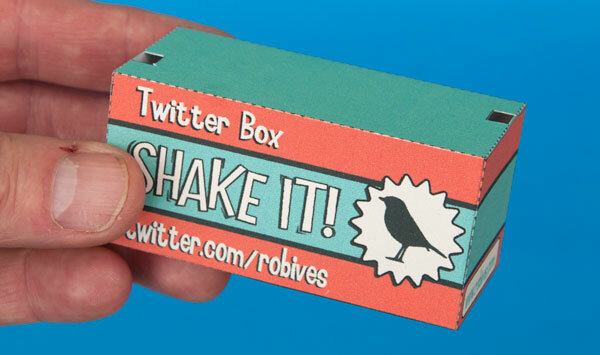 Once done, convert the box to display your own twitter address then hurry across to twitter and follow twitter.com/robives ! How frustrating! With pipes of any sort you need to be especially accurate. Make sure that there are no holes in the corners and that everything is lined up accurately. Check that the pipes work berfore you put the box together by blowing through them. Good luck! i dont know how to assembling the pipe body. in the picture doesn't see all the pipe (the end) can you send me a different angle of the image? Hi Manuel, I've added a couple of extra pictures above, I hope that helps. THis is a piece of garbage, I don't blame you, but when I assembled it the piston could only move up and down with aplied force, but not shaking. if there is a solution, please notify me. you should make more noise making projects because I love your projects you've made! 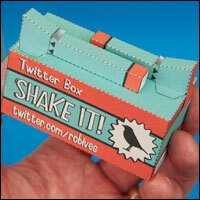 ← Twitter Box – nearly done.